Lucky girl that I am, I got to spend practically a whole day earlier this week at the Red Hook homebase of the fabulous Loup Charmant clothing collection. Designer extraordinaire Kee Edwards and I worked on a little copy, played with palettes and hues, and then I got to try on a slew of pieces from the SS12 Collection as well as some of the new Winter samples. My appetite has been whetted and now I am hungry like the Loup Charmant -- for fabulous, lounge-y and lovely fashion from LC! 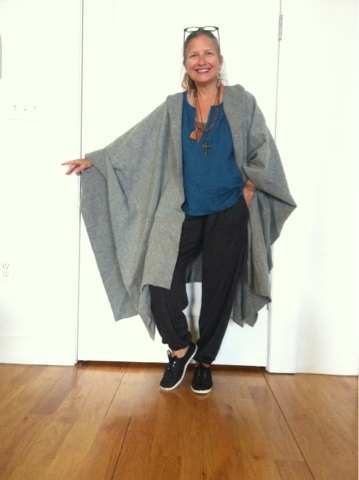 Below, the ultra cool wool snap cape, organic cotton peasant top and wool jersey jogging, worn with Kee's adorable new alpargatas, or Peruvian espadrilles. Cute, no? 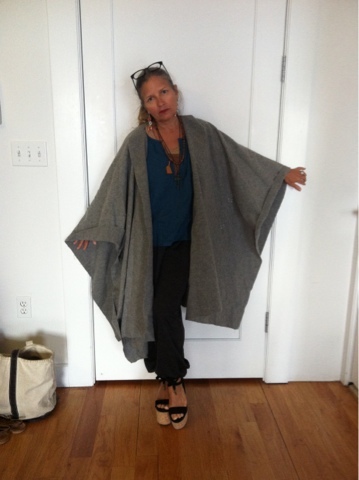 The cape and le winter jogging are absolute MUST HAVES for this next fall. Get your orders in now! Of course, you know me -- things normally have to be about shoes, so we kicked it up a bit and I switched to Kee's Isabel Marant suede cork wedgies. Wicked! Those sublime wool jersey jogging pants look just as great with heels as sneaks; I can't wait to rock this winter with short booties or straight up stilettos. 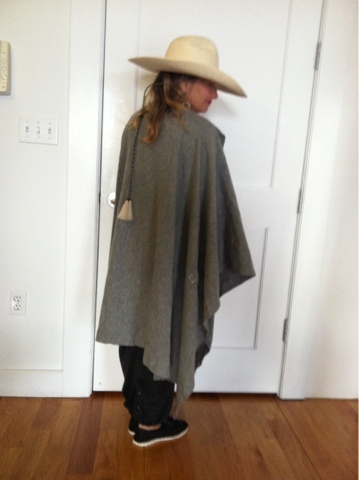 We added her amazing Texan hat with horsehair braid, a prop that I would wear in everyday life. Finally, a pic of Kee's tootsies in the hippest pair of tasseled flats that she just found during a recent spree. LOVE the cape! A little too hot today to really consider wearing it :) Bring on the Fall!